I have been reminded, again and again, especially in the last few weeks, how deeply each of us longs for connection. We are all, collectively, hungry for what we know is possible – a world in which connection comes before consumption and love comes before greed. When I re-built my website last summer, I felt strongly that the most important work that I can do in the world is to re-connect people with themselves, with others, with the earth, and with the sacred. This is the imperative work that we must ALL do. This is the only thing that will turn us away from this self-destructive, overly-consumptive, earth-destroying path we are on. We must return to connection. That is why a blog post about holding space can go viral – because it responds to our hunger for connection. We’re used to silly cat videos going viral, but this is different. This touches a place in our hearts that is hungry for more depth, more intimacy, and more connection. Since this whole thing started, I have been contemplating how I can further feed this hunger. How can I help you to make deeper connections with yourself, others, the earth, and the sacred? 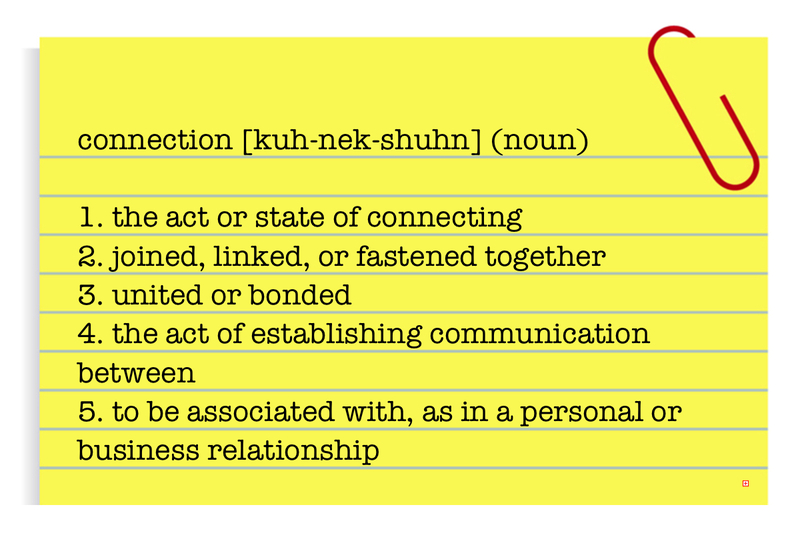 Here’s what I came up with… a special gift that will help each of you make deeper connections. 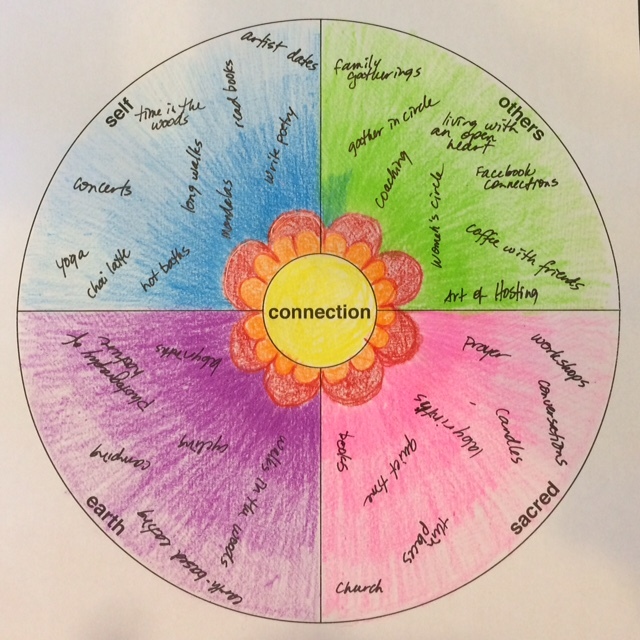 In Mandala Discovery, participants receive a mandala journal prompt each day that helps them work through a variety of themes such as balance, chaos, play, courage, and community. I would like to offer you one such prompt on the theme of connection. If this resonates with you, you are welcome to sign up for the class which starts on April 1st. When you make your mandala, remember that this is about the process and not the product. You are not making a work of art, so let your inner perfectionist go and simply delight in the process. There is a sickness in the world today. Only a deeper connection will help us address this illness that is running rampant in the world. We need a groundswell – a rising up of a huge collective (I started to say army, but that sounds to oppositional to me) of people who are determined that we will return to connection. We will give up our selfish, self-destructive ways and start making decisions based in love and community rather than greed and individuality. Will you be part of this collective? Will you have the courage to choose connection, even when advertisers are telling you to “buy more”, governments are telling you to “argue more”, real estate developers are telling you to “build more”, and society is telling you to “isolate more”? Each of us must make a choice, and together we will begin to shift this tide. Together we will create an environment that will make others hungry for what we have. We won’t change the world by fighting the existing culture. We will change the world by loving it into something new. 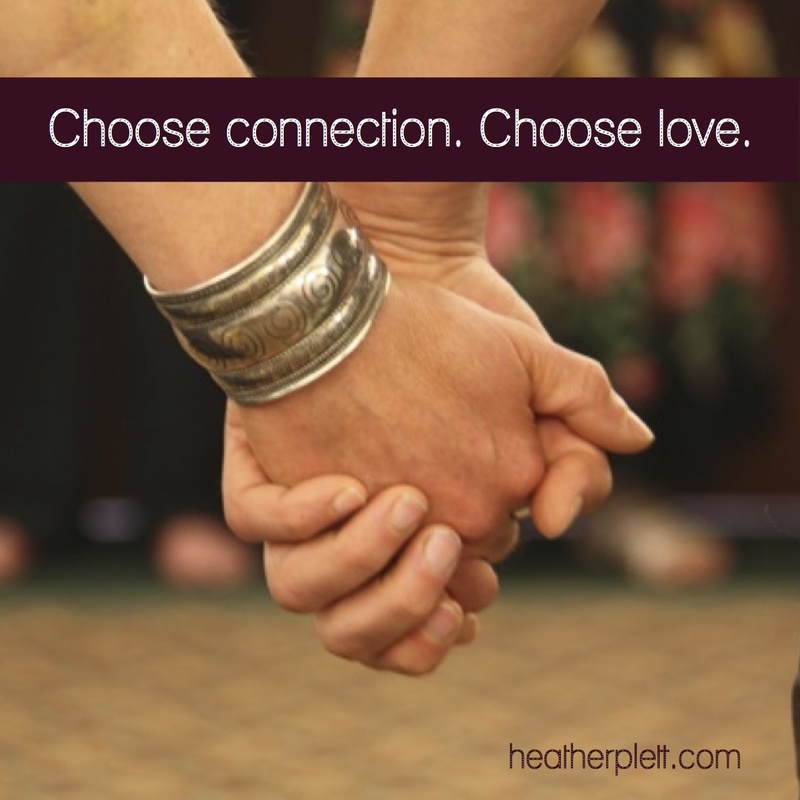 Once you make that choice, you will begin to open yourself up to deeper connections. That’s the first step. Then the next step is to be intentional about looking for opportunities to make those connections. Begin to ask yourself, each time you make a decision, “Is this choice based in connection or isolation? Am I making this purchase (or going on a trip, or saying no to an opportunity, or going for a walk, etc.) because it will help me to feel more deeply connected to myself, others, the earth, or the sacred, or am I making it because I feel isolated and I am trying to self-medicate?” Try to be as honest as you can with yourself, without judging yourself or being unkind to yourself. Start with mindfulness – simply observe without judgement. Gradually you will begin to witness your own patterns and this awareness will help you to see where you need to open yourself up to greater connections. If you are spending every night in front of the TV, for example, you may be doing so because you are feeling bitter about past relationships and you no longer know how to make friends. If this is true, then you may wish to take some small steps – take a class or join a sharing circle to find people to connect with. As you begin to connect, consider the balance of all four connections – self, others, Sacred, and earth. All four should be considered equally important. As your awareness grows, so will your understanding of where the gaps are. If, for example, you give up all of your time for other people and overlook your own needs, you will begin to recognize that your connection with self is lacking. Then it will be time to say no to some of your commitments so that you can spend more time in self-care. Instead of volunteering at the local foodbank, take a night off and go for a long walk in the woods. When you are deeply connected on all four counts, your life will be infinitely richer and your acts of service to the world and those around you will be much more meaningful. This is not frivolous stuff – this is imperative. A world full of connected people is a healthy world. 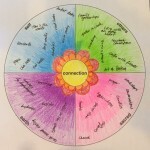 To take a closer look at your own connections and to become more intentional about deepening them, here’s a mandala journaling exercise that will help. In the small circle at the centre, write the word “connection”. This is your sweet spot – the place where all four connections come together. In each of the four quadrants, write the words “self, others, sacred, and earth”. Consider the things that you do that help you connect with self – do you go for long walks, do yoga, write in your journal, cook delicious meals? Write those things in the quadrant labeled “self”. What do you do to connect with others – go for coffee with friends, go on date nights with your partner, play games with your kids, take classes with friends? Write those in the quadrant labeled “others”. What do you do to connect with the earth – plant a garden, climb trees, take pictures of birds, go for long walks in the woods, ride horses? What do you do to connect with the Sacred – pray, meditate, walk labyrinths, fast, light candles, read sacred texts? Some things that you do might appear in multiple quadrants. For example, I like to walk labyrinths, which helps me connect with myself, the Sacred, and the earth. Write those things in each quadrant that they apply to. Once you’ve written all of the things you already do, begin to consider the things you don’t do yet but wish to. Do you want to take a yoga class? Find a sharing circle? Shop at organic farmers’ markets? Write those in the appropriate quadrants. Is there one quadrant that’s emptier than the others? Consider how you can bring it into better balance. Be intentional about seeking those things that will help with that particular connection. Once you’ve written everything you can think of, decorate the mandala however you like. Pencil crayons work well if you still want to see the words. The colouring time can be a time of integration and meditation as you set your intention to become more connected. Hang the mandala on your wall or keep it in your journal to remind yourself regularly about your intention to connect. If this mandala journal prompt was helpful to you, consider registering for the Mandala Discovery class that begins April 1st. You’ll receive 30 more prompts like this one, each day in April. Though they arrive in your inbox every day, you can take your own time working through them.